2016: Professor, Department of Chemical and Biological Engineering• University of New Mexico, Albuquerque, NM. 2011 - 2016: Associate Professor, Department of Chemical and Biological Engineering• University of New Mexico, Albuquerque, NM. 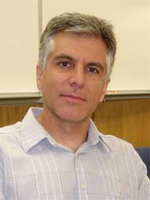 2005 - Present: Assistant Professor, Department of Chemical and Nuclear Engineering• University of New Mexico, Albuquerque, NM. 2003 - 2005: Research Assistant Professor, Department of Chemical & Nuclear Engineering and Department of Chemistry • University of New Mexico, Albuquerque, NM. 1999- 2003: Senior Research Associate, Center for Materials Research • University of Alabama, Huntsville, AL. 1998- 1999: Research Associate, Center for Materials Research • University of Alabama, Huntsville, AL. 1987- 1996: Research Assistant, Laboratory of Chemical Physics and Engineering, Department of Chemistry, University of Sofia. D. N. Petsev and G. P. Lopez, Electrostatic Potential and Electroosmotic Flow in a Cylindrical Capillary Filled with Symmetric Electrolyte: Analytic Solutions in Thin Double Layer Approximation, J. Colloid Interface Sci., 294 (2006) pp. 492-498. S. T. Chang, V. N. Paunov, D. N. Petsev and O. D. Velev, Self-Propelling Microdevices and Microfluidic Pumps Based on Remoutely Powered Miniature Semiconductor Diodes, Nature Materials, 6 (2007) pp. 235-240. N. J. Carroll, S. Pylypenko, P. B. Atanassov and D. N. Petsev, Microparticles with Bimodal Nanoporosity Derived by Microemulsion Templating, Langmuir, 25 (2009) pp. 13540-13544. N. J. Carroll, P. F. Crowder, W. Patterson, D. R. Ratnaweera, D. Perahia, P. Atanassov, and D. N. Petsev, Microfluidic Synthesis of Monodisperse Nanoporous Oxide Particles and Control of Hierarchical Pore Structure, ACS Appl. Mater. Interfaces, 5 (2013) pp. 3524-3529. E. M. Benner and D. N. Petsev Potential flow in the presence of a sudden expansion. Application to capillary driven transport in porous media, Phys. Rev. E, 87 (2013) pp. 033008. M. Fleharty, F. van Swol and D. N. Petsev, The Effect of Charge Regulation on Conductivity in Nanopores, J. Colloid Interface Sci., 416 (2014) pp.105-111. F. van Swol and D. N. Petsev, Molecular Dynamics Simulation of Binary Hard Sphere Colloids Near Glass Transition, RSC Advances, 4 (2014) pp. 21631-21637. M. Fleharty, F. van Swol and D. N. Petsev, Manipulating Semiconductor Colloidal Stability through Doping, Phys. Rev. Lett., 113 (2014) pp. 158302. M. Fleharty, F. van Swol and D. N. Petsev, Electric Double Layers at the Semiconductor-Electrolyte Interface, J. Colloid Interface Sci., accepted.